The summer festivals are the most interesting and intense cultural, traditional and musical events in the world. The tourists are looking forward for the areas where they occur and participate with pleasure to learn, to understand the local life and to have lots of fun. Music, contests, concerts, vibrant nightlife – you will take advantage of all these if you go to one of these summer festivals. One of these festivals is Notting Hill Carnival (located in Ladbroke Grove, Notting Hill, London) called also August Bank Holiday since all banks are closed on that day all over England. The event date is on Last Sunday and Monday in August. Since 1950, the Caribbean community in London kicked off the fun. Bright costumes, music, dancing and quality rum in one of the most exclusive neighborhoods of the most visited city in the world – all these represent this festival. You are going to see and listen to reggae music, bohemian characters, samba, relaxed people, beautiful women and a general atmosphere of flower-power, as you’ve never seen. Notting Hill Carnival’s origins are related to the noise races that were organized in Notting Hill and in the surrounding areas of West London, in 1958. Caribbean migrants were invited in the UK and given jobs in hope that their work will help rebuild the city after the war, but very soon they were confronted with racism of the white population. The carnival homages the vibrant culture of the Caribbean community and managed to bring together all layers of the society in a festive atmosphere. Nowadays, the Carnival is a spectacle of color, energy and exuberance, given in honor of the communities that have made London the cosmopolitan city of today. The festival takes place in late August and attracts about two million people. 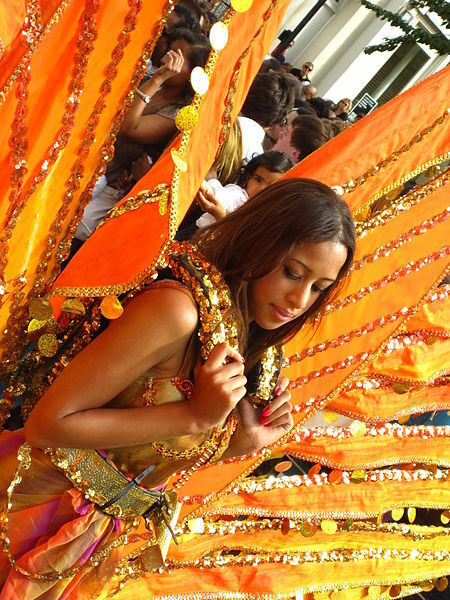 The enormous assistance and the attention that people give to this carnival means that Notting Hill is considered almost the biggest in the world, surpassed only by the one in Rio de Janeiro. The main attraction is the parade that takes over the streets. With some of the best costumes and dancers, the parade is the most spectacular attraction on the streets of London. Along the route which runs the parade, spectators cheer dancers or stop to eat at one of the many stalls in the area. If you have never tried Jerk Chicken, this carnival is the place to do it. A huge number of scenes are placed throughout, interpreting diverse performances that have roots in the Caribbean culture. Also, here are famous DJs and you will see many celebrities arriving to make contact with the exceptional atmosphere of the carnival. This Carnival is a great place for families, especially for families with children because they love parades, costumes and the atmosphere. In the past, there have been some serious problems of public order, and they still continue nowadays, despite the police efforts. So, some extra attention is necessary and another recommendation is that you should watch your pockets. The organizers are forced to remember every year that you can get to Notting Hill only travelling by public transport because the roads in the area are closed. Despite this, every year people try to get their cars and themselves in a crowd almost impossible to disentangle..